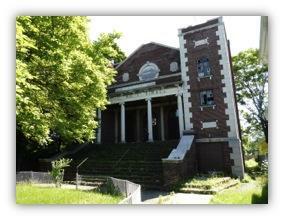 The former B'nai Israel Ahavas Achim synagogue, 692 Joseph Ave. in Rochester. This spring, a plaque will be unveiled to proclaim that an early 20th century synagogue in Rochester's northeast quadrant is now listed in the National Register of Historic Places. B'nai Israel is where hundreds of Jewish immigrants once worshiped when Joseph Avenue was a bustling commercial corridor. A local group of business, cultural and community leaders has been working for several years to renovate the more than 11,000 square foot building and use it as a performing arts center. "The ceiling has artwork on it and it has a chandelier that was built, I believe, in Germany in, it had to be the 1800s,” said Dr. Neil Sheier, president of the Joseph Avenue Arts and Culture Alliance. “The mechanicals have to all be replaced; the inside has to be all restructured and rebuilt." All of that is expected to cost about$3 million, according to Sheier, a former Joseph Avenue business owner who is committed to the revitalization of that neighborhood. He believes performing arts can be one of the keys to that effort. "Whether that is music, dance, theater… that has nothing to do with income level; that has nothing to do with where you're from, your heritage - that just has to do with you stepping up on a stage and doing your stuff, and it's always a happy thing." As the alliance looks for a developer for the former synagogue, it has launched a number of arts and cultural programs, including outdoor concerts, an upcoming bus trip to the Memorial Art Gallery, and after school performing arts programs at PUC Charter School and with the Community Lutheran Ministry. "Over the last couple of years as we've started working on the building, it's the community that has said to us 'Don't wait; do stuff now,' Sheier said, "and so even as we have our focus as creating this performing arts center, we are involved in so many different activities." The official celebration of the building's placement on the National Register of Historic Places is being planned for late May or early June.